Do you want to enjoy a spa-like shower experience in the privacy of your own home? When your bathroom design includes Moen's nine-inch rainshower shower head, you'll be able to lose yourself in the relaxation of a refreshing, all over body spray every time you take a shower. If you've enjoyed the benefits of showering with a high quality, forceful rainshower shower head before, you know just how invigorating this type of shower experience can be. While there are a number of rainshower heads on the market, Moen's offering is unique and offers homeowners the ultimate in "spa at home" showering experiences. Moen's rainshower heads utilize the company's state of the art InvigoRain™ spray to provide powerful and relaxing water spray. Moen's InvigoRain™ technology is self-pressurizing, which sets it apart from other similar products. “Most rainshower showerheads are gravity-fed so the water collects in the showerhead and slowly trickles out, creating a low-pressure, drooping effect,” said Atkins. “InvigoRain is self-pressurizing. It channels the water out of the showerhead for maximum water force and coverage.” With the Moen self-pressurizing rainshower, water is channeled through the fixture in a manner that produces up to three times as much spray as other rainshower fixtures on the market. What this means for you is that your shower experience will be consistently invigorating with this shower head, more so that with other available rainshowers. 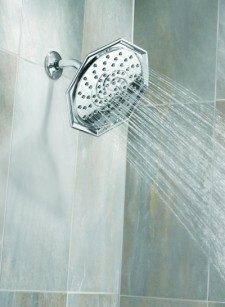 For more information about the rainshower heads available in the Inspire product line, see www.moen.com or visit your local Lowe's retailer.